Wood Toy Clock Discounts Apply ! 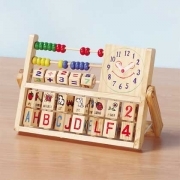 The Wood Toy Clock has the alphabet, beginning words, numbers, and time. Extra features include an abacus and a clock with moveable hands. For ages 3 and up. 10" x 1" x 7 1/4" high.